FRANKFURT, Germany -- Governments, police services and prison authorities around the world are reportedly "overjoyed" by the launch of a new prescription drug that cures people who are suffering doubts about the veracity of the so-called Jewish Holocaust. Soon to be marketed and sold under the name Holozac, the drug works by rapidly closing down the brain's centre of intellectual inquiry. It also blocks the re-uptake of politically incorrect neurotransmitters involved in critical thought processes, making it more difficult to distinguish between truth and lies. 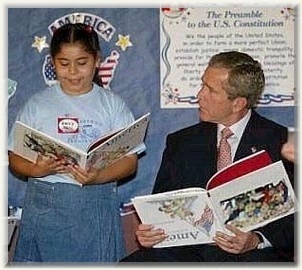 Satire: Bush misspeaks, or talks the truth for the first time? Feel free to reproduce this graphic. Bush misspoke as he delivered a speech at the signing ceremony for a $417 billion defense spending bill. "Our enemies are innovative and resourceful, and so are we," Bush said. "They never stop thinking about new ways to harm our country and our people, and neither do we." No one in Bush's audience of military brass or Pentagon chiefs reacted. Check the video, no text can convey it better. I've captured from The Daily Show the clip of W struggling to say "Fool me once, shame on you. Fool me twice, shame on me." Notice the look of abject fear as he realizes that he's going to muff it and it's going to end up on the news, and on damn fool weblogs.